SkySports have reported that Borussia Dortmund striker Pierre-Emerick Aubameyang was in link with Manchester City last summer. Aubameyang revealed that his father who is his agent was in continuous talks over his move to Manchester City few months ago. The striker had an exceptional last season, he netted 39 goals for the German club in all campaigns. Real Madrid, Paris Saint Germain and Arsenal were also interested in him and the reports revealed that the player is expected to move. 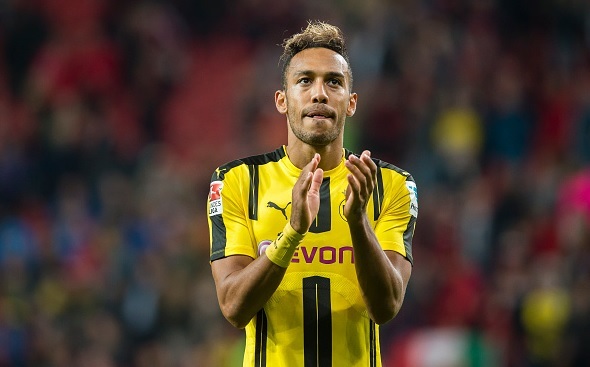 Aubameyang told revealed several important things while interviewing to Onze Mondial, he told that the Citizens were interested in his move but nothing was serious. Furthermore, he revealed that Real Madrid were also in the race. Few months ago, Aubameyang told that his dream is to play for Real Madrid so he will not be able to reject the offer if comes from Real Madrid. The 27-year-old Frenchman has scored 87 goals in 150 appearances for Dortmund since his move from Saint-Étienne in 2013.